Lawyers for alleged Russian spy Maria Butina have filed court papers indicating they have reached a deal with prosecutors and that she plans to change her plea to guilty. 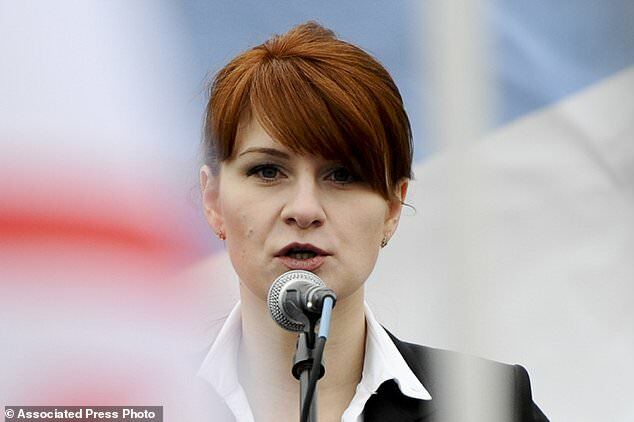 Butina, who is alleged to have used her cover as a student to infiltrate the politically-powerful National Rifle Association, filed a joint motion to 'set a change of plea hearing' as early as Tuesday. The former American University student, 30, has pleaded not guilty and previously has denied charges that she relied on contacts to infiltrate the NRA. Butina was arrested in July. A source told ABC News that she was now co-operating and had agreed to do so with federal, state and local authorities. During the campaign, she met Donald Trump Jr. at a May 2016 NRA event. She also had social contacts with Trump foreign policy advisor J.D. Gordon, and questioned then-candidate Donald Trump in 2015 during the run-up to the campaign at an event termed 'Freedom Fest' held in Las Vegas. 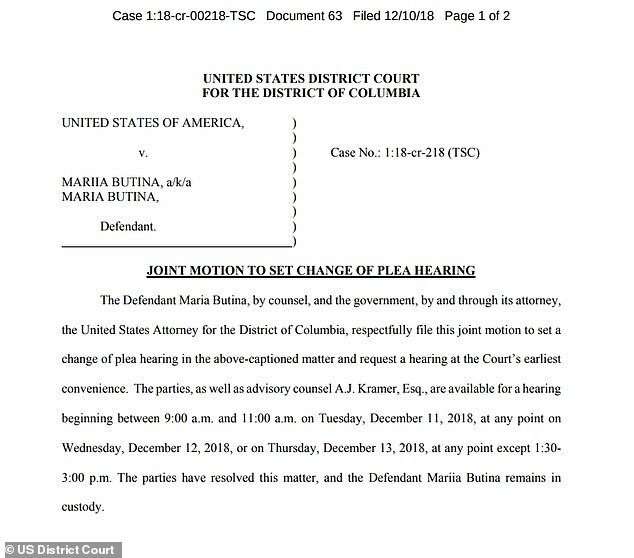 'The parties have resolved this matter, and the Defendant Mariia Butina remains in custody,' according to the letter from her lawyers. Butina is accused of being a secret agent for the Russian government, and has likely taken a plea deal. Late in the 2016 campaign, she socialized with Trump foreign policy aide J.D. Gordon, attending his birthday party. At one point, he invited her to attend a Styx concert. The two met at a party at the Swiss ambassador's residence. Gordon has said, and emails show, that they met on the introduction of GOP operative Paul Erickson. Butina and Erikson were in a romantic relationship. News of the change of plea comes after a pair of filings on Friday dealing with former Trump campaign chair Paul Manafort and former lawyer Michael Cohen shed new light on the number of Trump circle Russia contacts during the 2016 campaign. That number has now climbed to 14. According to emails obtained by the Washington Post, Erikson described Butina as a 'special friend' of the NRA. The information was included in a filing in the case against Maria Butina. Her lawyers and federal prosecutors have asked for a hearing as soon as Tuesday morning. Prosecutors say her contacts were directed by Russian banker Alexander Torshin. At the 2015 event where she asked Trump a question, she inquired about his position on Russia and on U.S.-imposed sanctions – which have been a major concern for the Kremlin. 'I know Putin, and I'll tell you what, we get along with Putin,' Trump responded. 'Putin has no respect for President Obama. Big problem … I believe I would get along very nicely with Putin, okay?And I mean where we have the strength. I don't think you'd need the sanctions,' Trump responded.